The WVGISUG was formed in 1997 to provide a forum for users of ESRI and other GIS products to meet, interact, view demonstrations, and participate in technical discussions. 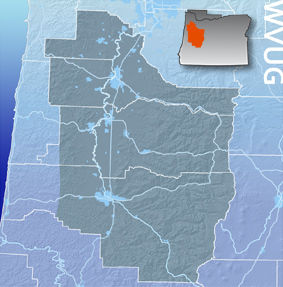 We are currently sponsored by the Mid-Willamette Valley Council of Governments . Our current membership consists of over 200 people from all over the greater Willamette Valley from Salem to Eugene and is still growing! Our philosophy is that as users, we can all learn from each other. With that philosophy in mind, we are trying to provide the means and opportunity for users to get to know one another, and therefore be able to exchange information and expertise. Group meetings are held quarterly for this purpose and rotate between four regional locations. Please see our meeting schedule and upcoming meeting pages for more information, or contact Lesley Hegewald if you have any questions. If you would like to be added to the mailing list, please click on Membership in the black menu bar at the top of this page, and complete a member application. Membership is free! Make sure to check the box for Willamette Valley under Section Member to be included in our mailing list. Members receive email notifications about upcoming meetings and other events. We do not contact members for commercial or promotional purposes. 2/26/19 ***WINTER MEETING CANCELLED/POSTPONED DUE TO INCLEMENT WEATHER*** Rescheduled date TBA.